This is only a small book and would have fitted well into that ” Very Short Introduction to ….” series put out by Oxford University Press. As it is, it is part of Palgrave Macmillan’s series on ‘Theory and History’ which aims at introducing undergraduate students to themes like transnationalism, gender, narrative, postmodernism etc. and history. It is very clearly written, and while the experience of reading it is enhanced if you are familiar with some of the biographies that she describes (as I am) , it stands in its own right as a review of the methodological and narrative questions raised by the relationship between history and biography. Barbara Caine was Professor of History at Monash University and is now at the University of Sydney. Many academics working in biography come from the literary studies area, rather than history. Her projects and publications testify to her long and deep experience with biography, autobiography and history, and the ways to approach an individual life as an exercise in historical methodology. In her introduction she notes the deluge of biographies that have hit the bookshelves in recent years. Partially this reflects the shift away from grand narratives in history, but it also emphasizes the attraction of seeing individuals within their own social world. There has been a shift away from the ‘great man’ approach and new biographical approaches have sprung up in response. 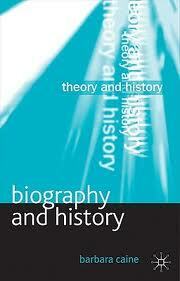 In Chapter 1 she addresses the long-standing debate about the precise relationship between biography and history. Classical historians focused on the character of significant public men as a prompt to emulation, and in the 17th and 18th centuries with the rise of the novel, biography was seen as a way of eliciting sympathy in the reader. Thomas Carlyle in 1830 insisted that “history was the essence of innumerable biographies” and this belief was echoed by Ralph Waldo Emerson in America who also insisted that history was essentially composed of the lives of significant individuals. But in Europe, and particularly Germany, this view was being challenged by Ranke and his scientific approach to history and the archive. Marxist theory rejected the ‘great man’ theory, insisting instead that circumstances make men as much as men make circumstances (p. 18). Twentieth century approaches to history and biography have been influenced by the Annales group and ethnohistory with their emphasis on microhistory to explores the mentalites of unimportant individuals. Chapter 2 ‘A History of Biography’ seems at first similar to the first, but it takes a different tack by addressing the idea of the ‘private’ and changing ways of discussing character and personality. Samuel Johnston occupies an important place in the history of biography, both in his own biographical writing (most particularly The Life of Richard Savage) and as the subject himself of Boswell’s classical study. During Victorian times, there was a new emphasis on morality, propriety and respectability, but by the early twentieth century there was a deliberate shift to subverting and critiquing these Victorian values. Freudian psychology was taken up in the biographical quest, and while many historians are diffident about its overt use in biography, there arose (and still exists) a concern with depicting fully the personality of subjects through their emotional and interior lies as well as their public ones. The stress on the domestic and private has been a way of exploring the significance of gender, both for significant men and women, but also for less privileged and less visible women. Chapter 3 is devoted to collective biography. One example of collective biography is the encyclopaedic genre of collections of biographies (e.g. The Australian Dictionary of Biography) which with computerization provide new opportunities for cross-searching by categories, time and networks. However, she rejects prosopography ( the meta-compilation of patterns and types often across career and political groupings) as a biographical enterprise, drawing as it does from encyclopaedias of biographies and flattening out personal and individual stories as it does so. Since the 1970s there have developed group biographies which look at groups of siblings, social groups or intellectual networks as the site of analysis. Many literary biographies fall into this category e.g.Mary Lovell’s book on the Mitford sisters; and intellectual collective biographies like Menard’s The Metaphysical Club or Jenny Uglow’s The Lunar Men (which I really must read one of these days). Life writing and auto/biography are explored in the fourth chapter. The slash in the term ‘auto/biography’ genre suggests that autobiography and biography are closely linked in form and that the writing of a biography usually involves some form of autobiographical writing. I admit that the inclusion of the biographer into the story is something that I have struggled with for some time. On the one hand, when I’m reading history, I do like it when all of a sudden the author comes out from behind the curtains, looks me in the eye and talks to me. But I’m also leery of the way that an intellectual tussle with another person’s life becomes turned into a ‘journey’ or ‘quest’ like some hackneyed Who-Do-You-Think-You-Are type documentary. In some of my drafts (yes, they do exist), I have written myself in but I’m not sure that I’m going to stay there. Then there is the genre of historians’ biographies autobiographies that I seem to be noticing more and more. Are there more of them (e.g. a string of biographies on Manning Clark recently; memoirs by Manning Clark himself, Inga Clendinnen, Eric Hobsbawm; biographies of Keith Hancock etc.) or is it just that I’m attracted to them while I’m flailing around in the academic shallows? Chapters 5 and 6 were probably the most useful for me. She opens Chapter 5 with Virginia Woolf’s question “My God, how does one write a biography?” when she was grappling with writing the life of her close friend Roger Fry. This chapter examines the different approaches to writing biography, especially those that have emerged as part of the ‘new biography’ current today. She notes that there is little theoretical discussion of how to write a biography. In particular she examines Paula Backschieder’s four questions in Reflections on Biography: the voice of the biographer, the nature of the relationship between biographer and subject, the ways in which evidence is understood and dealt with, and finally how the personality of the subject is understood. Caine returns again to the use of psychoanalysis in biography, noting that only a very small number of historian biographers utilize it, as distinct from literary biographers. She picks up on the approach that I’m most attracted to- that of texts and performances, noting that its a way of writing that is of particular value to historians (p. 102). The final chapter ‘Changing Biographical Practices’ returns to the question of consciousness of gender, and the usefulness of microhistory as a way of focussing on individual, often obscure, lives from one particular source. Many historians who use such techniques see their work as histories rather than biographies, where they use lives to show wider social patterns. However, as Jill Lepore has noted, the emphasis within microhistory on using a life to illustrate a broader pattern cuts across the traditional biographer’s belief in the uniqueness of his/her subject. In this book, Caine emphasizes the paucity of theoretical reflection on the techniques of writing biography amongst historians, especially compared with literary biographers (most especially Richard Holmes, whom she cites frequently). I’ve borrowed several other compilations of papers from conferences and seminars arranged around the topic of “Biography and History”, and she has covered succinctly much the same material and at a higher level of abstraction. If, as she claims, historians don’t talk enough about how they write biography, then this is a good start. This entry was posted in Biography, Book reviews, History writing. Bookmark the permalink. Excellent review. You have me ready to look for this book since these are questions that interest me enormously. Thanks. Thank you. It’s only small but it seems to have covered the ground pretty thoroughly. Thankyou for this… as your correspondent above notes, I am also ready to seek out this book. I also think psychoanalysis has much to contribute by way of complementing the Annales and Ethohistorians. We seek to know the hearts of others through knowing ourselves. I sensed that Caine was rather equivocal about the use of psychoanalysis. I think you’d be interested in what she has to say. This sounds like a go-to book for studying biography. I checked the Australian Womens Writers’ Challenge reviews and couldn’t find this review. It would be great if you could add it. Done- I had hesitated about posting it on the Challenge site for fear that it’s a bit ‘text-book’y but she IS an Australian Women Writer.